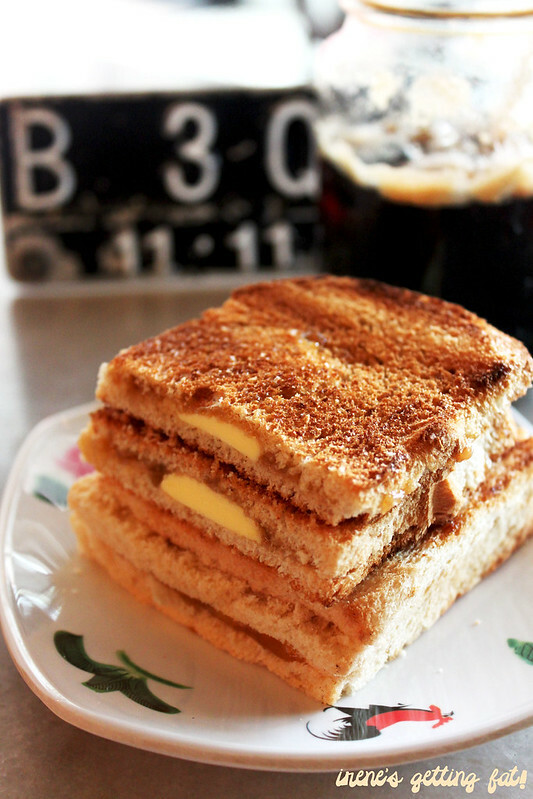 Kopitiam means kaya toast to me. And iced Milo with heaps of Milo atop. 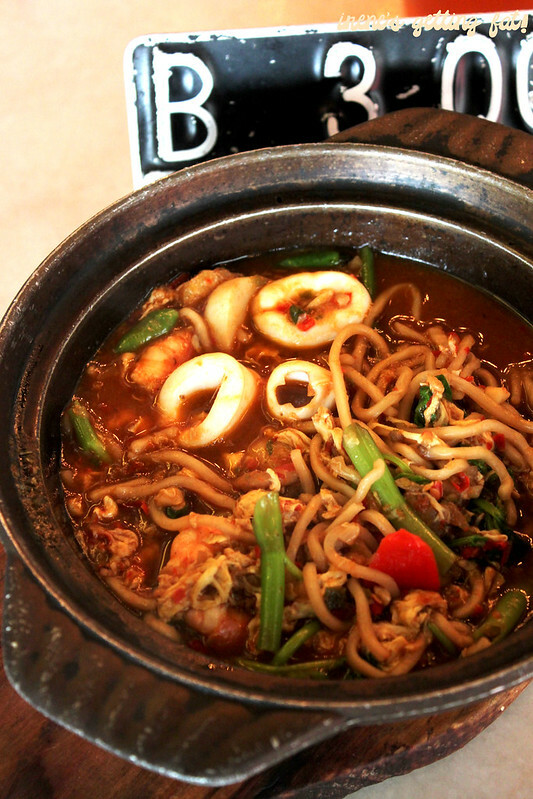 And delicious Malaysian or Medanese dishes. Meanwhile, it says coffee for the parents. And the brother will go anywhere as long as you feed him enough. 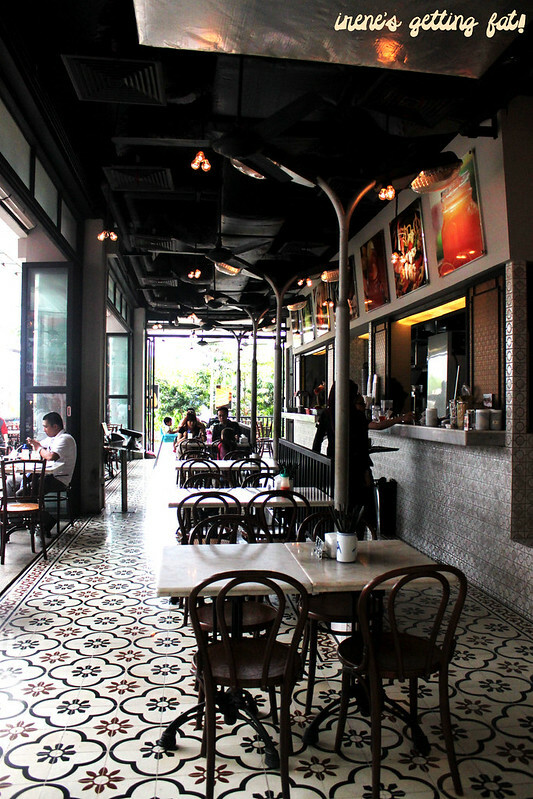 Kopitiam or Medanese/Malaysian-based coffee shop is the family newest safe haven for our mall-visiting Sundays. 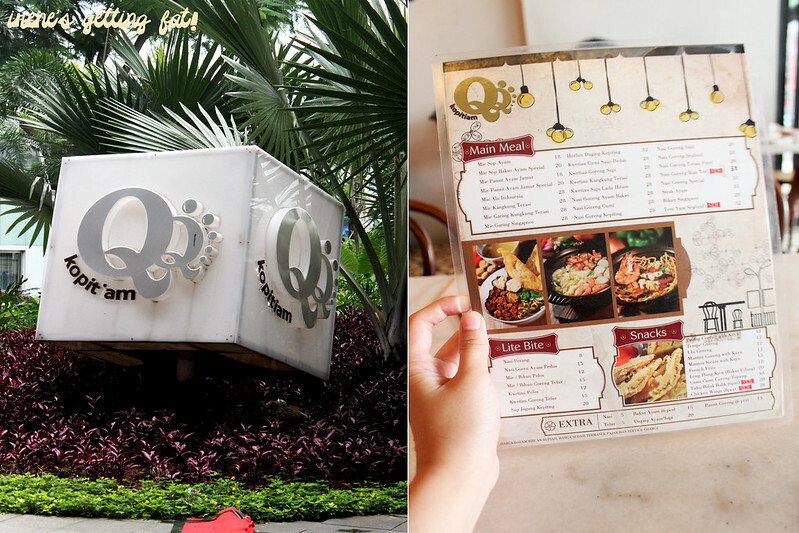 And so, we gave QQ Kopitiam at Summarecon Mall Serpong a visit on a humid Sunday. It's located on the Downtown Walk area in the second phase of the mall, you can't miss it once you take a glance to the big signage cube, on which the 'i' letter on the word 'kopitiam' has been deleted. I guess this is about the copyright issue of the name that was widely talked about last year. Apparently, it's an open and non-air-conditioned area, so it's inconvenient for non-smoker customers. Fortunately, there weren't any smokers intending to kill my family slowly with their smoke that day; if there was I probably wouldn't have taken a seat to begin with. Plus, we took seats on a further corner of the room. 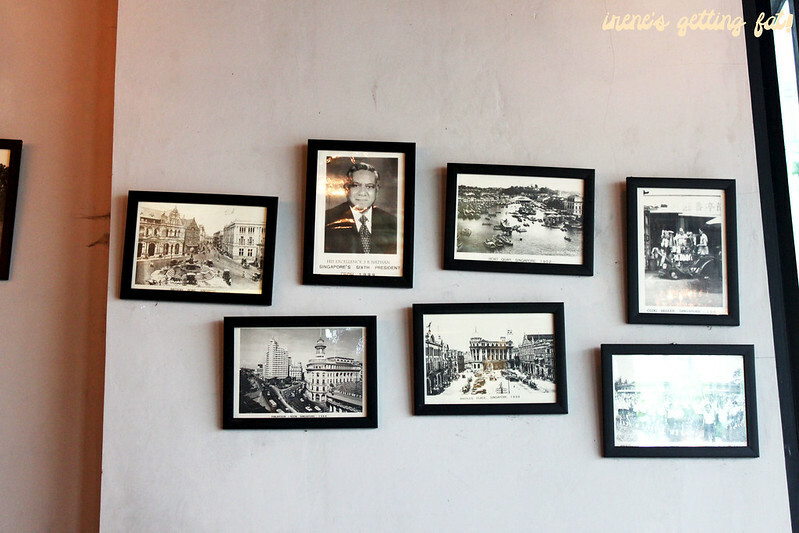 The place has this lovely vintage feel; with street lamp miniatures, wooden chairs, and old-looking pics. 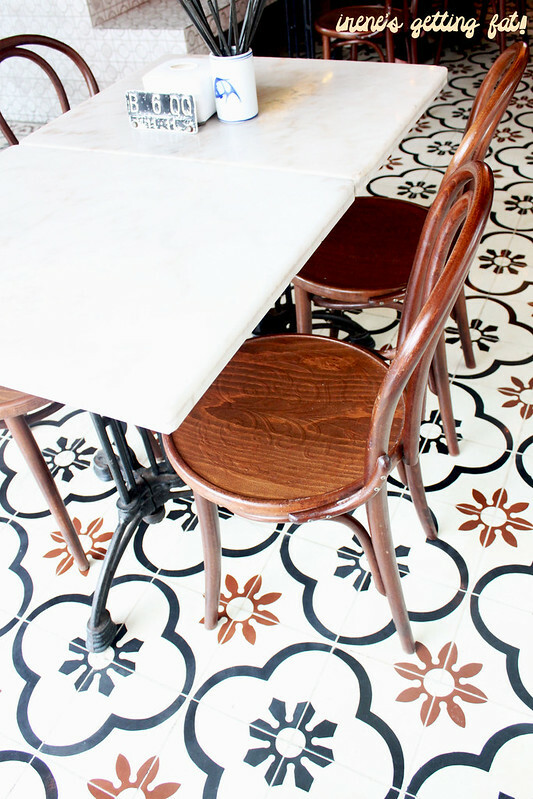 I also adore the floral-patterned flooring, because I love brownish colours generally, and I love floral pattern. It fits the place's image very well. 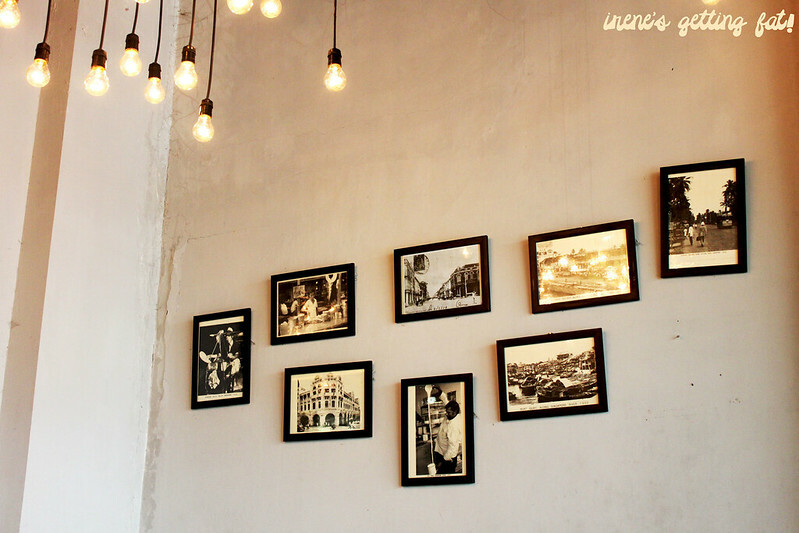 I didn't get a closer look of the pics, but they give a kind of museum-like ambiance. The waiter took our orders quickly, and then the drinks started coming up in cute jar-glasses. All three were very refreshing in the humid environment. My milo dinosaur is everything I could wish for: creamy, thick flavour of Milo (plus some more on top), and icy cold. The lemon tea peng is lovely, but the jus kedondong (ambarella juice) is the one that made our tongues dance with its stingy yet adorable sourness. Of course, the jar-glasses made them look even more adorable. Moving on to the meals, the mother and I chose two of the most recommended menus from QQ. The mother had the spicy looking mie terasi kangkung (noodles with shrimp paste and water spinach), which came in a hot-bowl that guarantees high serving temperature. This dish is such a wake-up call. It pinches your taste buds with the sourness, slight spiciness, and the unique scent of shrimp paste. The seafood pieces are given quite generously, and the kangkung is still rather crunchy. Mine looked tamer compared to the previous, but as appetizing. 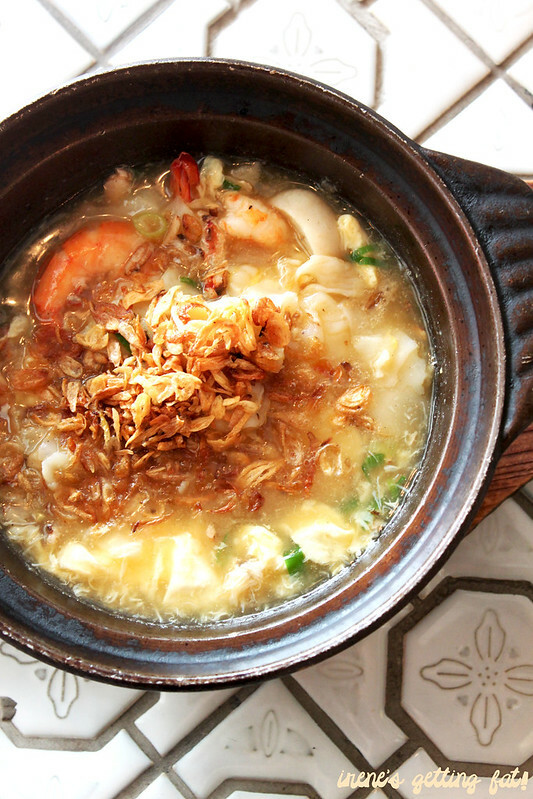 Horfun kepiting (rice noodles with crab in thick egg gravy) is a belly-warming comfort food. 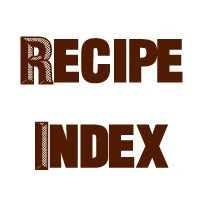 It's seasoned very well, and I love the thick, flavorsome gravy. The other ordered items were satisfying, but not as superior as the previous two. The father's mie pangsit ayam jamur spesial (noodles with chicken, mushrooms, fried wontons, and meatball soup) is more than decent; I particularly like the soup that came with it, as it seems to have a kind of fragrant herb/spice that I couldn't really identify. The food's portion is quite small; although it doesn't bother me, some may find that one plate isn't enough. Obviously this is the case of my bottomless-stomach brother. 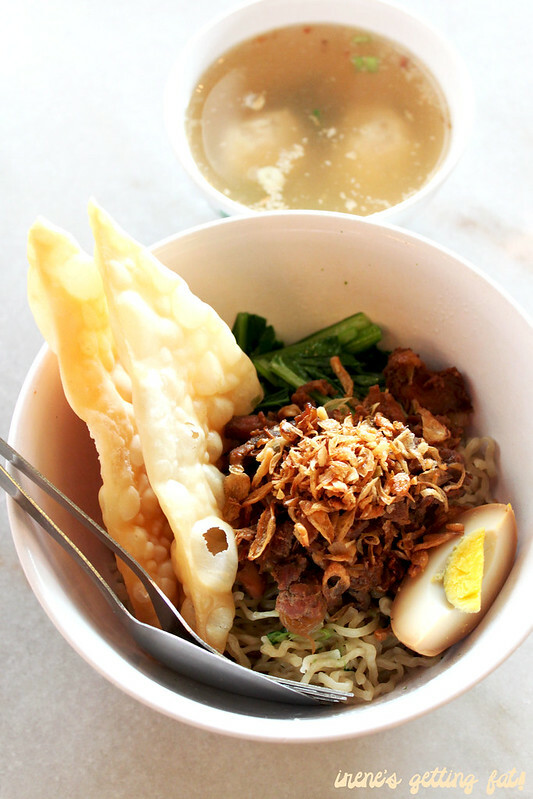 His kwetiau sapi lada hitam (stir fried rice noodles with black pepper beef) and nasi goreng sapi (fried rice with beef) are safe options among the menu. 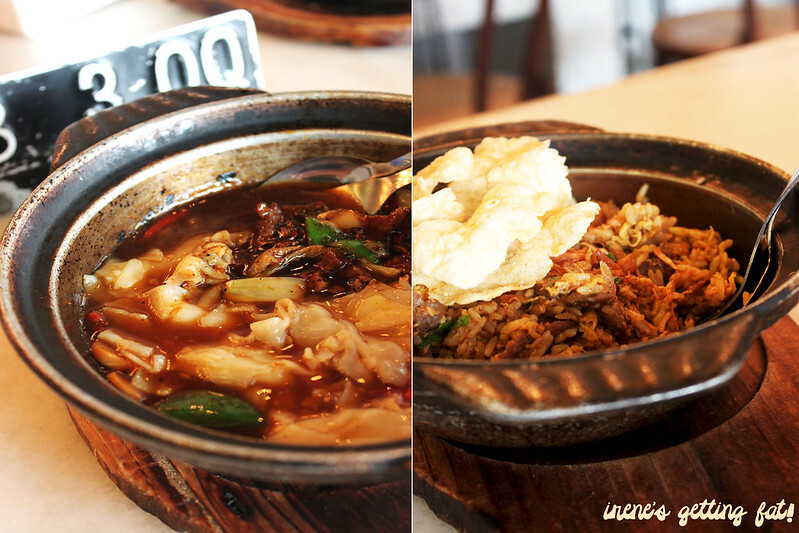 Both have good flavour, but I prefer for the fried rice to be less oily. 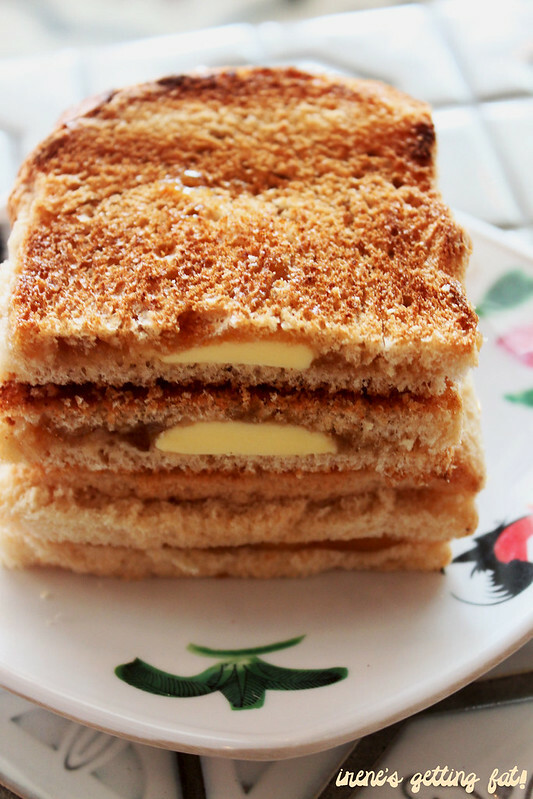 Here comes another highlight of the day: the kaya toast. The toast seems to be a halved thin toast, filled with perfect amount of kaya spread (although I don't mind more of it) and a slab of butter. It's uber crispy, soaked lightly in the middle by the luscious kaya spread and melted butter. We actually fought for the last slice of this one. 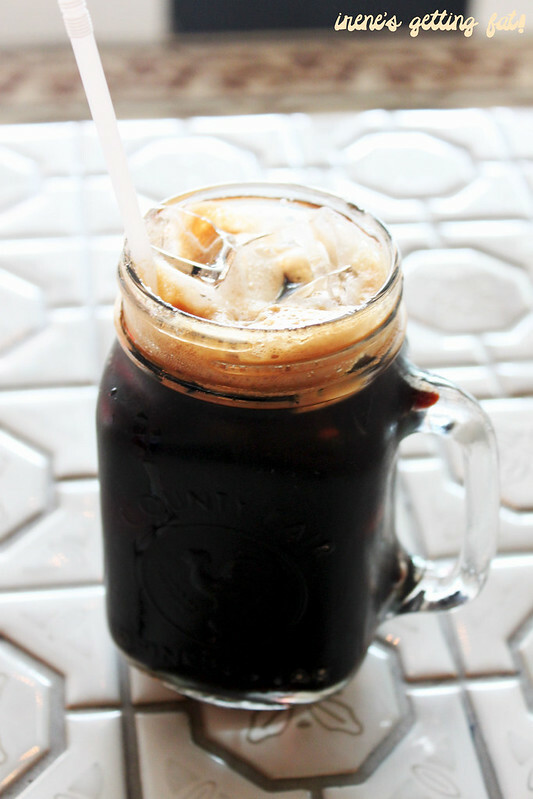 The toast is a great accompaniment for the last drink ordered: kopi 'o' peng. The parents love this one a lot, but I reckon it'll be much better if there is more sugar added. But that's maybe because I'm not a coffee buff. The main meals are satisfying overall, but I personally would come just for the kaya toast and Milo dinosaur to spend my afternoons with. Great mie kangkung terasi and horfun kepiting, portion may be too small for some, lovely kaya toast and drinks, service is quick and helpful, price is relatively high, ambiance is OK as long as there are no smokers around. Wah kangkung terasi pake kwetiau enak tuh kedengerannya! It's great that you have a loving family. My brothers also agree to go anywhere as long as they get fed too. 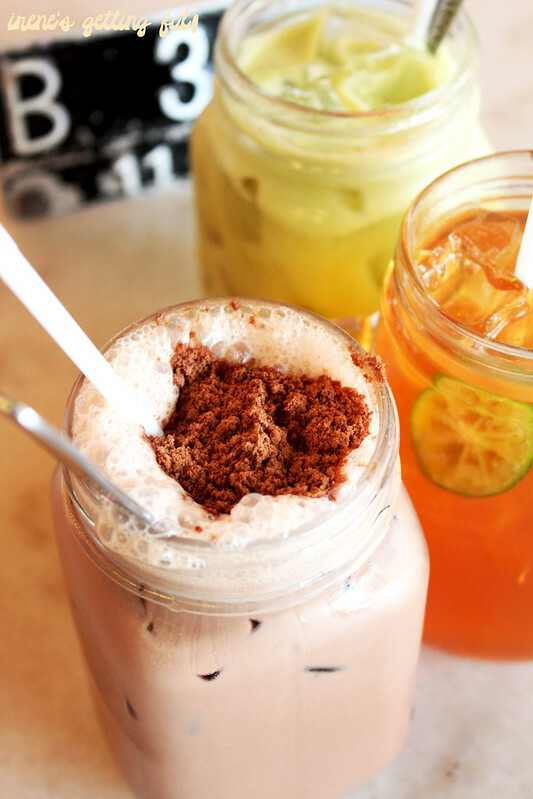 The food looks good, I really like how the drinks are served in jars. LOL we probably have the same type of a brother then! maksudnya ukuran asli fotonya atau setelah dimasukin ke post-nya? Kalo portrait 500x750, kalo landscape sih ganti" tapi yg ini 520x375. Look at all the foooooodddddd!! You have given me some serious food envy! Thanks for dropping by, Shanshan!